I had spent the night camped off County Rd G about 10mi west of Cortez, CO. The previous two days in Arizona were exercises in getting as high as one can in a desert state to avoid the summer heat. At 5,500ft I wasn't all that high, but it was as close to Ute Peak, the most prominent peak in Montezuma County, that I could drive. I had planned to hike the 4mi, one-way distance to the peak from the north in the morning but found it already too warm when I awoke just after sunrise. I had come to Colorado for high peaks, wildflowers, alpine meadows and pleasant temperatures, not another desert experience. So I changed tactics on short notice and drove north through Cortez (stopping at the Walmart for a few last-minutes supplies) and headed to the 12,340-foot Elliott Mtn in Dolores County, west of Rico and the Dolores River. Elliott is a P2K, the secondmost prominent peak in the county and the highpoint along the popular Calico National Recreation Trail. The dirt County Road 38, just north of Rico, provides access for any vehicle to The Meadows at 10,000ft about 4.5mi northeast of Elliott Mtn. The Calico Trail starts just south of this high meadow, but I found it closed due to wet conditions. Though the closure appeared weeks past due and the trail likely dry now, I dared not park at the empty trailhead and draw the wrath of angry rangers or other Coloradans. This proved fortuitous because another good dirt road allowed me to drive to the East Fork Fall Creek TH which was miles closer and several hundred feet higher to boot. Now barely a mile NW of the summit, I would be able to climb Elliott, its two nearest neighbors, and another half dozen peaks further south as well. The area is open to hikers, equestrian, mountain bikes and motorcyclists, too, making it quite popular for all but the hikers and perhaps the equestrians. I would run across more than a dozen cyclists and dirt bikers, but no one else out on foot all day. At 9:30a, it was a somewhat late start from the East Fork TH, but I would have plenty of daylight to get done what I could manage. The trail starts up through forest on a twisting, rooty trail before opening up above treeline in less than half an hour. It took barely 45min to reach the Calico Trail on the crest south of Elliott Mtn. Here one is greeted with a sight common in these parts, but not so much in the High Sierra - wonderfully green slopes with abundant wildflowers. Above 12,000ft, the Sierra hasn't much to offer besides rock. This area in particular is laced with numerous trails that makes travel a breeze, all connected by the Calico Trail which graces on or near the N-S trending crest. The trail bypasses Elliott's summit on its western flank but the cross-country up the SW Ridge is rather easy and I reached the top by 11:20a, less than two hours after starting out. I found a register here, but like most Colorado summits that feature them, the jar was crammed full with entries and went back only a few years. There is a nice view of the Dolores River drainage looking north and east. To the northwest are the higher summits around Dolores Peak and the Wilson/Diente Group which made a nice backdrop as I continued over the summit and down the gentle North Ridge. Papoose Peak is 2/3mi north of Elliott and frankly not much of a summit, which I supposed I should have expected, given the name. It's 500ft lower than Elliott and the summit is a big, flat grassy field with no discernable highpoint. I returned to the Calico Trail and turned south, following it the junction I had reached from the East Fall Trail, found between Elliott and Sockrider. 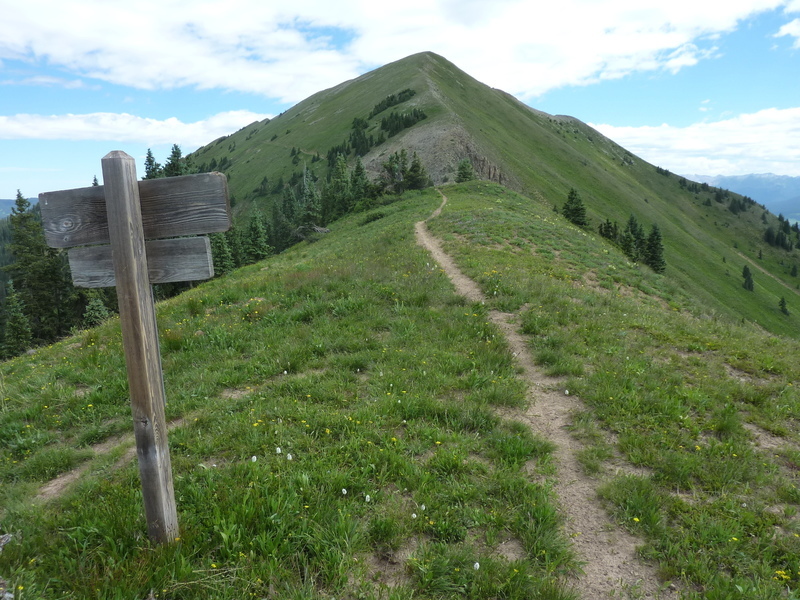 An easy, hiker-only trail goes up from this saddle to follow along the ridge to the summit of Sockrider Peak, less than a mile southwest of Elliott. I continued southwest along the foot trail for another mile to a second junction with the Calico Trail. Almost immediately after the junction I left the main trail again, this time to ascend Johnny Bull Mtn, 1/3mi up from the trail. A use trail is present for part of this ascent but not really necessary. Unlike the previous summits, its top is strewn with rocky talus. It was now just after 1p and I'd reached the four summits I'd planned, but with lots of daylight and extra energy, I decided to continue to tag another 4-5 summits. I dropped south off Johnny Bull, crossed the Calico Trail again, passing through a saddle and trail junction before starting up to Calico Peak. This was the only one that had even some modest difficulties, a huge talus slope up the North Ridge and a class 2-3 descent off the SW Ridge. From Calico's summit one can look southeast to see Anchor Mtn about a mile away, and southwest to Eagle Peak about half that distance. As I reached the trail at the saddle between Eagle and Calico, I stopped to address a foot issue that had begun to bother me. My boots had been rubbing the skin on the large toe of my left foot for some days and previous efforts with bandages that wouldn't stay put were having little effect. Some duct tape would have done nicely here, but I was carrying little in the way of the ten essentials or first aid items. It occurred to me that I might cut off the thumb of my leather glove and use this to protect my toe. It was hardly on the Red Cross list of approved medical procedures, but it worked quite nicely - plus, I had another pair of newer gloves back in the van. I tackled Eagle Peak first, all of about 15min from the trail, then returned to the same junction and headed southeast to Anchor. I met a pair of very polite motorcyclists on my way to Anchor along the trail, who pulled over and shut off their motors even as I had already moved over to let them pass. We chatted briefly and one commented about the terribly dry conditions and the drought they were experiencing. I looked around at all the green and judged they haven't been to California. It was 3p by the time I topped out on Anchor with two peaks remaining. Expectation Mtn was 2/3mi to the east with Storm Peak about the same distance to the southwest. I headed east from Anchor Mtn along the connecting ridgeline, dropping to a saddle before climbing 300ft up a use trail to Expectation's summit. I knew the Burnett Trail could be found hundreds of feet below on the south side of Expectation, and that that trail would lead back up to Storm Peak at a saddle south of the last summit. For only the second time today without the benefit of at least a thin use trail, I headed cross-country down steep slopes to the southwest in search of a trail I could not see from above. I found it after about 15 minutes' effort in dropping some 700ft from Expectation. I was more than five miles from my vehicle at this point and would spend the next two hours getting back to it, all on trail. The Calico Trail let me retrace my route north along the crest without having to re-ascend any of the other peaks along the way. At the junction and saddle between Johnny Bull and Sockrider, I descended the West Fork Fall Creek Trail which while not exactly getting me back to my original TH, got me back to the road I had driven in on. From there it was a simple matter to walk the road about a mile back to my starting point. Nine peaks in nine hours - not a bad haul, and not the sort of thing one can do easily in California. As it turns out, it's not really so easy in the San Juans either, I just happen to pick a very accessible area with a bunch of easy 12ers to play around on. I drove back out the pavement at Colorado Hwy 145 and then north to Telluride. I was supposed to be in town many hours earlier in order to meet up with my friends Eric and Steve with whom I was to spend the next week. It so happened that they were hours late in driving from Albuquerque and had arrived only an hour before me - nice!